The E7 Floor Lamp brings all of the innovations of task lighting to a stand-alone frame. 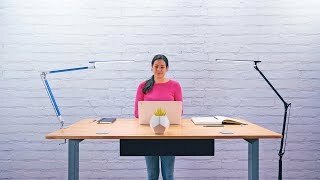 Enjoy the height needed to light desks, countertops, or tables. The sturdy floor base keeps the E7 stationary and minimizes shaking during use. A rotating lamp head lets you angle the light as you need. Two joints along the neck of the lamp make it extensible and easy to maneuver. The E7 comes in black, blue, or white, with bases in black, silver, or white. What is the benefit of a task light? Task lights are like advanced lamps, designed to protect your eyes and direct your light in ways that reduce strain and improve the quality of your workspace. You'll find features like adjustable necks, rotating heads, and dimmable bulbs in well-designed task lights. Is the E7 a task light? It is! The E7 floor lamp has all of the design elements we put into our desktop office lighting, just with a base that allows it to rest on the floor. If you're looking for something flexible and customizable, there's nothing better. How many levels of brightness are there? The E7's stepless dimming means there are no specific levels of brightness. Just hold the power button down to lower the light and let go when you're happy. Hold it again to bring it back up. You can set the brightness at precisely the level that feels comfortable for you. Can I put this on a desk? If you prefer, then yes. The E7 has an optional clamp mount that will allow it to attach to desktops under 2.25” thick. We want you to be able to place your lighting as conveniently as possible. Will I have to change the lightbulb? Nope, you do not have to change the bulb in the E7 Floor Lamp. The LED light bulbs we use are much longer lasting than standard, incandescent bulbs - rated for up to 50,000 hours of use. This means that even if you use the light for 12 hours a day every day, it will take over a decade of use for the light to burn out. The lamp's color palette is divided into two parts. The base comes in black, silver, or white. The lamp itself comes in black, blue, or white. You do not need to get the same color base as lamp, so feel free to choose the combination of colors that best suits your space! We offer the E7 LED Floor Lamp in black, blue, or white color options to match your office decor. Get comfortable, adjustable lighting in any of our three frame colors. The base for the E7 LED Floor Lamp comes with its own color choices: black, silver, or white. Black and white will match the corresponding lamp color, and silver will nicely compliment our blue lamp option. Or, mix and match as you'd like. There's no reason all lamps need to look the same!